Jim Goodwin says St Mirren aim to hold on to seventh place until the end of the season after admitting the Buddies have fallen short on their ambitions. The Paisley side are unbeaten in four and are currently two points clear of 11th place, the position which will lead to a relegation play-off. 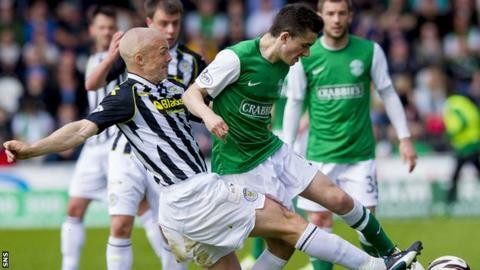 "We're well aware that we have under-achieved," captain Goodwin told BBC Radio Scotland's Sportsound programme. "We just want to make sure now that we can finish seventh in the table." With Hearts' relegation from the Scottish Premiership confirmed several weeks ago, the focus in the bottom six after the split has been the battle to avoid finishing second bottom and entering a two-legged tie against one of the top sides from the Championship. "It's been the inconsistency throughout the season that's put us in the situation we're in now - fighting to avoid the play-off position, which is not what our ambitions were at the start of the season," explained Goodwin. "The three games are all very difficult in their own right. Ross County are never an easy team to play, Kilmarnock away is always difficult and Hearts are in fine form at the moment. Three huge games but all winnable. "I'm sure every team in the bottom half believe that they can beat each other and we're no different. "We all take responsibility for the position we find ourselves in and we've all come together. Recent results have all gone our way and we've been playing well. "We're in a good run of form, we're extremely confident at the moment and our aim now is to finish top of the bottom half. "It's an exciting time from a fan's point of view and also from a player's point of view. It gives us something to play for right down to the very last kick." Goodwin believes the eventual opponent for the Premiership's second-bottom side will be buoyant. "The key word is momentum," he added. "The team that finds themselves in 11th place has maybe been on a bad losing streak whereas the opponents that they're going to find themselves facing from the Championship will have been used to winning games. "I think that's going to be a huge deciding factor in the play-off final at the end."